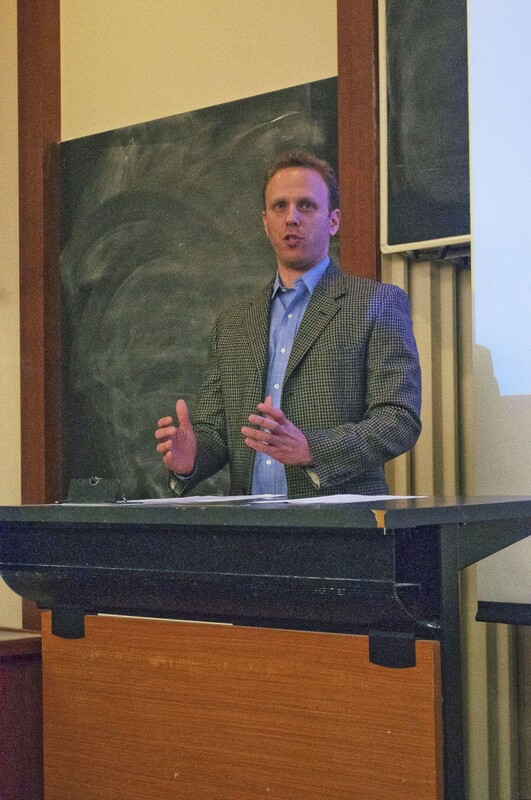 Max Blumenthal, an award-winning journalist and author, spoke out against Israeli claims to legitimate democracy in a talk entitled “Myth, Illusion, and Israel’s Democracy” last night in Stuart Hall. The talk comes just two weeks after U.S. ambassador to Israel Michael Oren touted Israel as the strongest and only democratic U.S. ally in the Middle East. Blumenthal referenced Israel’s unfortunate reaction to Gunther Grass, a Nobel winning German poet, who recently denounced the Israeli nuclear mobilization toward Iran in a poem. “This 84-year-old man has now been barred from entering Israel. Other Palestinian poets have been assassinated by Mossad. That’s what you get for speaking up,” he said. An American-born Jew, Blumenthal is best known for his viral YouTube videos exposing Israeli military brutality, hostile Israeli youth, and seemingly undemocratic laws. Blumenthal criticized Israeli laws since the state’s founding for being “demographically,” rather than “democratically,” justified. Numerous laws prohibit non-Jews from marrying, living in certain areas, reclaiming property, and attaining Israeli citizenship. “These laws are oppressive to anyone who isn’t J-positive–that is, ethnically Jewish,” he said. Blumenthal doesn’t see a solution to the conflict arising from Israel in the near future. “The oppressed are in no position for action. The international community is the only means to change the status quo. The Boycott, Divestment, Sanctions (BDS) movement is the only path I see to change,” he said. The talk was sponsored by the RSO Students for Justice in Palestine (SJP). Blumenthal is former senior writer at The Daily Beast and author of Republican Gomorrah: Inside the Movement that Shattered the Party (Nation, 2009) on the rise of radical conservatism in American politics.